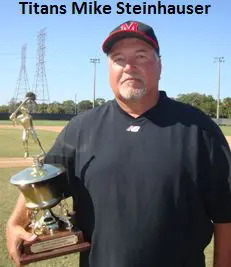 Clearwater, FL., November 15, 2014 – It’s only fitting that the Southern Maryland Titans and manager Mike Steinhauser won the Fall Classic’s inaugural 56+ championship. When you’ve won four titles you’ve already earned your place in the tournament’s history. Now, they’ve sealed it permanently. And leading the way all tournament was Phillips. Hitting nearly .750 for the week and joining Kevin Clark by going 5-for-5 to pace a 26-hit attack in a 23-7 playoff blasting of Sports Specialties, in which the Titans actually trailed 5-2 in the fifth inning, Phillips was at it again in the championship game. Against Puerto Rico, Phillips drove in three key runs to finish the tournament with 23 and yet, despite his stellar play, wasn’t an easy choice for team MVP. The victory capped a perfect 7-0 record for Southern Maryland. For the Ole Timers, a 4-0-1 round-robin record sent them to a thrilling playoff match-up against the New Jersey Reds. Trailing 11-9 in the bottom of the 10th inning, Ivan Pineiro’s game-winning single capped a three-run inning and earned Puerto Rico’s ticket to the title game. The momentum from the playoff victory seemed to carry over as the Ole Timers scored three runs in the second and another in the third to take a 4-2 lead. But with Southern Maryland scoring runs in each inning, the advantage was short-lived. The Titans got a run in the third and took the lead for good in the fourth when Russell Unilowsky doubled in the tying run and scored the go-ahead run on a ground out. When Southern Maryland scored four more in the fifth and a pair of runs in the sixth and seventh innings, all that was left was for Moore to close the door. Moore, who won his seventh MSBL title and was scheduled to start, entered with one-out and the bases loaded in the sixth. But, in what would be the Ole Timers’ last opportunity to mount a comeback, the right-hander got a strike out and ground out to preserve the lead.